In my previous blogs, I talked about the controversy surrounding long term low calorie or low carb diet. Now new evidence also brings the benefits of low fat diets into question. 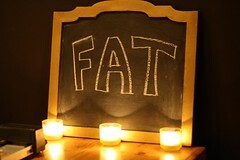 We actually need fat – that is, good fat – in our diet. In fact our hormones cannot function without the good fat. Over 7000 men and women were involved in the study. The study concluded that a Mediterranean diet supplemented with either extra virgin olive oil or mixed nuts may cut the risk of cardiovascular events by as much as 30% in subjects at high risk of developing heart disease, as compared with people advised to eat a reduced-fat diet (read more…). Here are some quick tips for cooking with fats and oils without turning good fats into bad fats. For high heat: Use coconut oil (I use it for cooking chicken. I love it). Olive oil will turn rancid with high heat (above 120 degrees). For medium heat: Use extra virgin olive oil, sesame oil, coconut oil or butter. Real butter from grass fed cow would be the best. For baking: sunflower, safflower or olive oil are fine if oven temperatures are less than 325 degrees. In a hotter oven, use only butter or coconut oil. Use coconut oil for coating a pan or cookie sheet. Enjoy the fat and oil! This entry was posted in Nutrition and tagged bad fat, Cardiovascular disease, Fat, good fat, Heart disease, Low-fat diet, Mediterranean diet, New England Journal of Medicine, Olive oil, rancid fat, sesame oil. Bookmark the permalink.